William Morrow Cookbooks, 9780062078452, 320pp. Easy, healthy, and fun lunch ideas for every age! Filled with lots of great menu planning ideas; tips, tricks, and reusable product suggestions to make lunch fun; inspiring color photographs, advice on dealing with food allergies and so-called picky eaters; and more than 160 tried and true recipes, Weelicious Lunches takes lunchtime planning from hassle to joy! 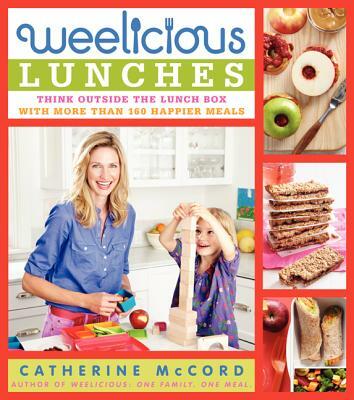 Catherine McCord is the founder ofthe popular website weelicious.com, a 2013 Babble Top 100 Mom Food Blog, one of People magazine's most influential mommy bloggers, and author of the Weelicious cookbook. She attended the Institute of Culinary Education in New York City, has worked in several high-end restaurants, is a contributor to Parade, and has appeared on Today, Good Morning America, The Chew, and The Doctors, and in magazines such as Parents, Parenting, Lucky, Working Mother, and Every Day with Rachael Ray. A former television host, she lives in Los Angeles with her husband and two children. Catherine McCord is like a magic godfairy delivering fresh ideas and warm encouragement day after day.